The stakes are higher than ever in Mass Effect 3, says BioWare. Ancient machines threaten the Earth, and only you are in a position to stop them: What do you do? Well, one of the things you can do is make a complete mess of it and let angry mechanical star gods destroy the whole planet. BioWare has let slip that one of the possible endings in Mass Effect 3 is that Commander Shepard can fail to stop the Reapers, thus dooming the Earth, and the entire galaxy. BioWare's Mike Gamble revealed that this baleful possibility existed, although obviously he wouldn't go into too much detail - or indeed, any detail at all - as to how it came about. However, he did say that the stakes were higher in Mass Effect 3 than they'd ever been before. "In Mass Effect 3, the theme is literally galactic extinction, so the choices that you make can have that much larger consequences, and because of that, you think a little bit harder before making them." He said that it was difficult to account for all the decisions a player might make, not to mention the different combinations of decisions, but that having so many options made the story better. "A lot of the satisfaction [in Mass Effect 3] comes out of the choices that you made, so when a story concludes a certain way, the way it concluded was in part because of the choices you made." He also said that the choices increased the game's replayability, as people could go back and try out different branches of the story. This isn't the first time that BioWare has included a "bad ending" in a Mass Effect game: in Mass Effect 2 it was possible for Shepard to die at the end, but then - as will undoubtedly be the case in Mass Effect 3 - the player only had him or herself to blame. I like the idea that victory isn't guaranteed, as it helps make the story all the more immersive. You'll probably defeat the Reapers at the end of the game, but when you do, it will be the result of - potentially - three games worth of good decisions. 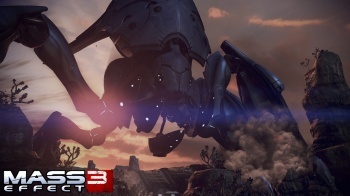 Mass Effect 3 comes out for PC, PS3, and Xbox 360 on March 6th.